Over the past few weeks I have closely looked at various styles of recording to prepare myself for a major upcoming event. In the course of reviewing various other graphic recordings, it has come to my attention that style is one aspect, but audience focus is quite another. The level of detail and clarity of information varies from personal to a complete detached audience. Some visuals seem unsure who they are trying to speak to or hope is viewing. To achieve the task of graphic recording, I believe it is critical to know how far along the involvement path your visual is targeted to reach. Is your task for personal visual note-taking and noting details that are important to you, tasked to capture details that participants will value or recording for an unseen detached audience for later viewing? This a personal viewer point. This is a one-on-one or very small group where the content of the recording is created with much interaction with the recorder. . This audience level may have little interaction with the recorder, but may see the action of recording as part of the event. 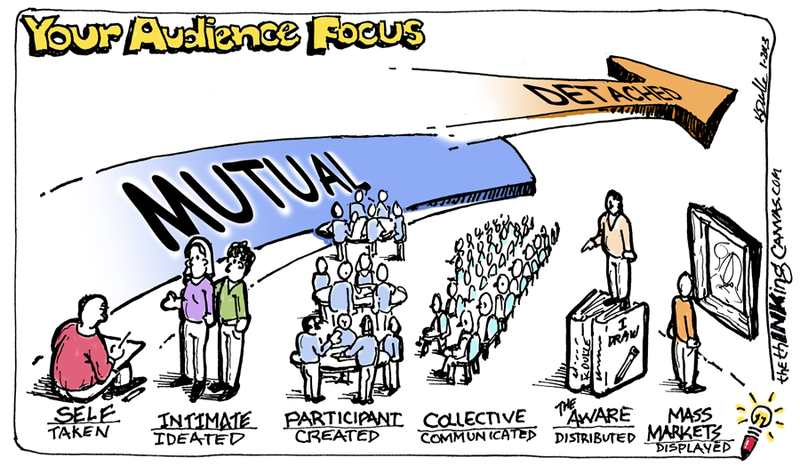 The value of the content should focus on the collective group and all collaborative information. This audience is a larger group that may or not be present during the recording, but are aware of the event and its content. Piece is more for recall of highlights and key topics. These are viewers are in the “know” about the source and may follow a topic or presenter and have not attended the event where the recording was originated, but are searching for insights to key topics.